Topic Categories Family Values The Most Beautiful Birthday Party I Have Ever Attended–Didn’t Even Know the Boy! Attending a birthday party in and of itself is not something remarkable. However, this party, this communal “event” was something altogether different…and inspirational! A few weeks ago, there was a small, innocuous Facebook post by a mother here in Maale Adumim. Her son, Matanel, was about to celebrate his 6th birthday. But, due to his having cerebral palsy, he basically had no social circle of friends, as he had not been able to ever attend any school or “go out and play” like other children his age. She asked if a few people would be willing to come to her house to make a small showing and party for him to bring him some joy and that he would not feel left out on his birthday. The response was truly overwhelming! Hundreds upon hundreds said that they would be happy to come. All wanted to bring joy into this child’s life and that of his family, as well. 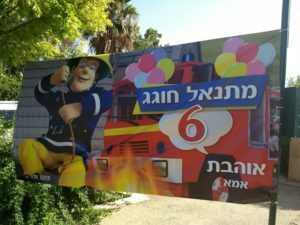 The mayor of our beloved city Benny Kashriel, went into action as well, spreading the word of the upcoming event and asking for people to show up. And show up they did…in droves! 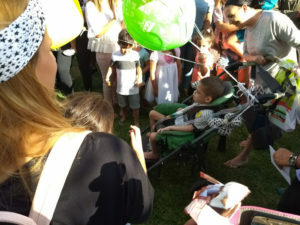 Hundreds of people came to a party for a boy they didn’t even know. 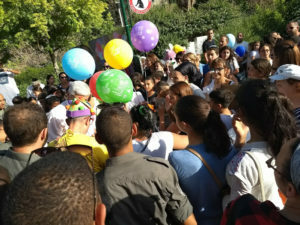 The party was held at a park and not at the family’s house, due to the enormous outpouring of love from so many people. Food was donated, music, clowns, magicians, “wandering minstrels,” treats and cakes were brought to share with the burgeoning crowd. 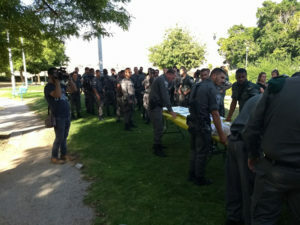 An entire company of soldiers from Mishmar HaGvul (Border Patrol) came in full uniform to share in the joy, as well! 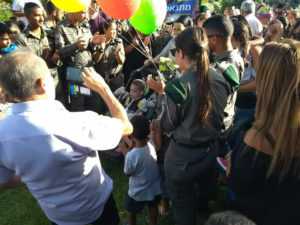 I have to say, that it was clear that 99% of those in attendance had never met Matanel; yet, we ALL celebrated as if he was our own child…because, in one respect, he truly is! 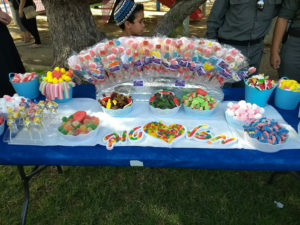 A sweet, young child to whom a tremendous amount of joy was brought…all courtesy of the amazing residents of Maale Adumim. Thanks to the heads of the city. And thanks to the companies who donated food. More, thanks to those who donated their time and their service. Ashrenu! We are so fortunate to have such an amazing, loving and caring city! 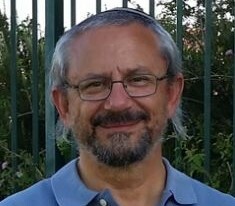 תזכו למצוות! May we always be in a position to share with one another B’simcha, and always be willing and able to help one another with joy and abundance! Zev-I posted your very moving and heartwarming story on my FB page and in a few groups i am in. With tear in my eyes, this beautiful story show the good in mankind…. May everyone who attended little Matanel’s party be blessed many time over. I’m sharing. Thank-you Zev for blogging. Wow, beautiful story. It’s wonderful to see that people come together to care for another, even if it’s someone they did not know before. Thanks so much..yes, it was an amazing event!